Scratch is a friendly Guardian who recently started his career as a protector of GoBotron. 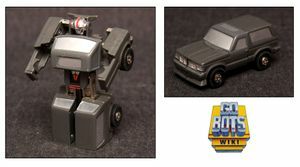 GoBots Scratch converts from robot mode to a Ford Bronco 4x4 truck. 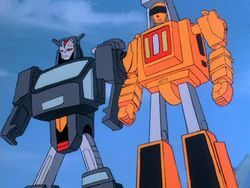 After the original line of Machine Robo toys was exhausted, Bandai created Scratch and several other designs specifically for the GoBots line in the Western market. Scratch's name appeared twice in the translated code from "Cultural Appropriation", sending him to two different levels. One of these was likely meant to be Stretch, a Renegade who does not otherwise appear on the list and whose name is only off by two letters. 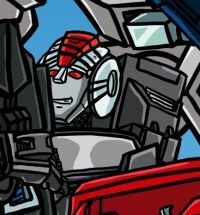 Scratch's Cybertronian-style body from the "Cataclysm universe" is modeled on Trailbreaker from the Generation 1 toyline with the head of Generation 1 Arcee. This page was last edited on 8 May 2018, at 16:04.